It’s hard to believe that it’s been over a year since Pixelocity Software launched Disc Drivin’ 2 (Free), the sequel to one of TouchArcade’s biggest reasons for loss of productivity over the years. This sequel brought everything we loved about the original and added in some pretty drastic new mechanics that freshened up the turn-based racing experience. We loved Disc Drivin’ 2 in our original review, and Pixelocity has updated it a number of times since, including 4 new tracks and a new obstacle last June and full chat support alongside the launch of an Android version last August. But they’re not finished! 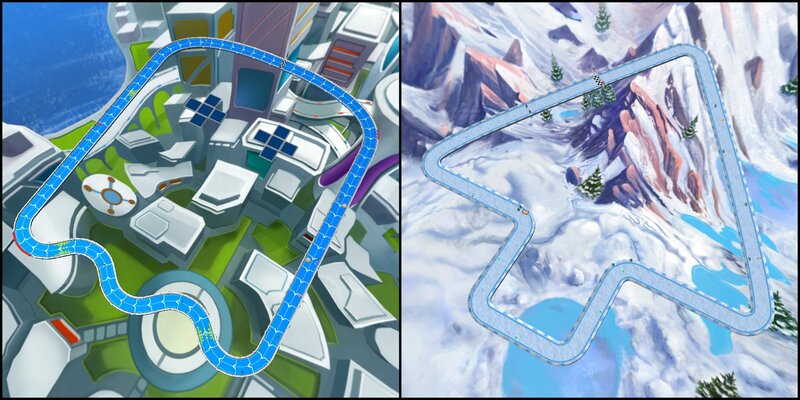 Just today two more new tracks have been added to Disc Drivin’ 2, one shaped like a ghost and one shaped like a tree. There’s also a new tree branch obstacle, because trees, and Disc Drivin’ 2 is now optimized for the latest iPad Pro models. Most importantly of all is that this new update is a good reason for me to start up my Disc Drivin’ habit again. I tend to go through phases of playing it so heavily I burn myself out, then take a little time off before inevitably coming back for more. It’s like an additction but in a good way. If you haven’t tried out Disc Drivin’ 2 then now is a good time for you to start your own habit by grabbing it for free on either iOS and Android, and no matter which platform you get it on you’ll have plenty of competition as the two versions can play with each other cross platform.